Revlon Professional brings innovative products to professionals and consumers alike, for people who set bold goals and create a fierce style. Revlon Professional is the choice for anyone who understands that each head of hair is unique. Revlon inspires you to design a look that is as individual as your beauty. Since the 1930s, Revlon has been revolutionising beauty and glamour with bold colour, from the first nail polish to the beauty icons of today. Revlon champions strong, real people who express their personality in an unapologetic and confident way. Revlon Professional extends this philosophy to the area of professional hair care products, that nourish and colour the hair while maintaining hair health. 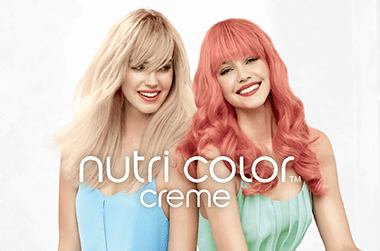 Introducing the cult favourite: Revlon Professional&apos;s Nutri Colour Creme range. The revolutionary take-home hair treatment not only creates luminous locks in a flash, but also repairs damaged hair to ensure an ultra-healthy look every day. Perfect for maintaining hair health in between salon visits, Revlon Professional Nutri Color Creme enhances colour and corrects fading, while reversing visible damage and keeping hair radiant thanks to its enriching properties. Each colour treatment in the range is numbered according to international hairdressing systems and indicates very precisely the level and tone of each shade – your hairdresser can advise which colour treatment is the most suitable for you. Formulated with an exclusive blend that combines cosmetic ingredients with a conditioning system, including provitamin B5, grapeseed oil and a selection of ionic pigments. The Nutri Color Synergy Complex nourishes the hair fiber with a 3-in-1 effect to get an impeccable combination of colour, care and shine. For fade-free locks, look no further! This has a fresh coconut smell that I really enjoyed. My hair is quite curly and this treatment didn&apos;t sit that well in my hair. Once my hair dried it was left feeling a bit sticky. I think this might be better for those straight hair ladies out there looking for shine and a lovely fragrance. Helped tone down and soften my lightened hair. Left my hair feeling amazing. I mix it with 931. This is such a lovely all in one treatment I love how it protects the hair from heat and UV whilst making is extremely soft and silky. I have fine hair and this is great because it does not leave it limp, the only thing I would add is that I don&apos;t believe it adds volume, however, I would use this solely as a leave-in treatment/protection product and it definitely works for that! LOVE LOVE the smell not overly floral so doesn&apos;t overpower but does make your hair smell so fresh.